Pavi's Platter: Mexican Mixed Bean Salad ! Mexican Mixed Bean Salad ! Mexican Bean Salad is a colorful, spicy and delightful salad for a dinner or a party. With a variety of beans combined with the corn, red onions and avocados there is an array of colors making the salad extremely appealing and inviting that no one can say no it. It is apt for a family dinner or when you want to take in huge quantity for a potluck. The dressing plays a vital role in this, the tangy and spicy dressing takes any boring salad to another level. Loaded with proteins from the mixed beans and egg, good fat from avocado and vitamins from the peppers this salad is more of a meal type salad than just sides. There is no detailed steps or recipe as such.. actually just combine all the ingredients with the cooked beans. As I refrain from tinned ones, its little time consuming to make this and requires planning ahead to soak the beans overnight and then cook them. You can make this ahead of dinner time , refrigerate it (upto 24 hours) and can serve cold too. Soak all the dry beans (separately) overnight or for 10 - 12 hours. Pressure cook them (together or separately) until they are done. Microwave sweetcorn for 3 - 4 minutes. Finely chop red onion, green and red bell peppers. 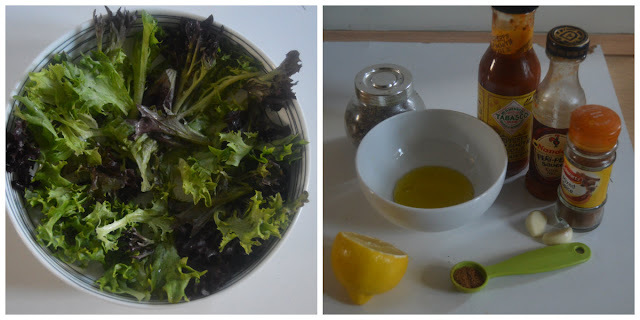 In a shallow bowl, spread the salad leaves. Finely chop the garlic, or mince it. 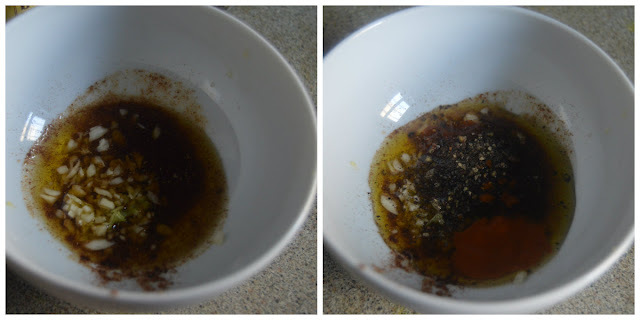 Combine all the ingredients for the dressing in a small bowl and mix well. 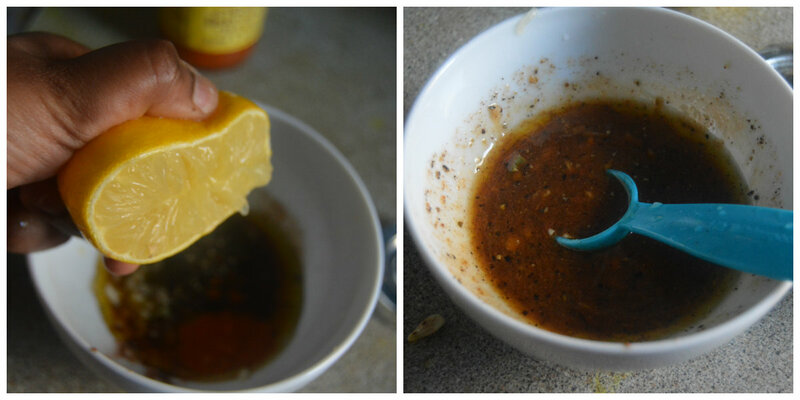 Lastly squeeze in lemon juice and give a mix. Arrange the cooked beans and other ingredients on the leaves in the bowl, and drizzle the dressing on them. Shred some boiled egg on top and serve. I would recommend soaking and cooking the black beans separately as it gives the black tint to the white canellini beans. If you are not worried about the fancy looks, just soak all the beans together and pressure cook them together. Toss with other ingredients and the dressing and whip up a quick meal for dinner. A very easy way to make this would be just buying the ready to eat bean cans and just toss up everything together to make a quick meal. 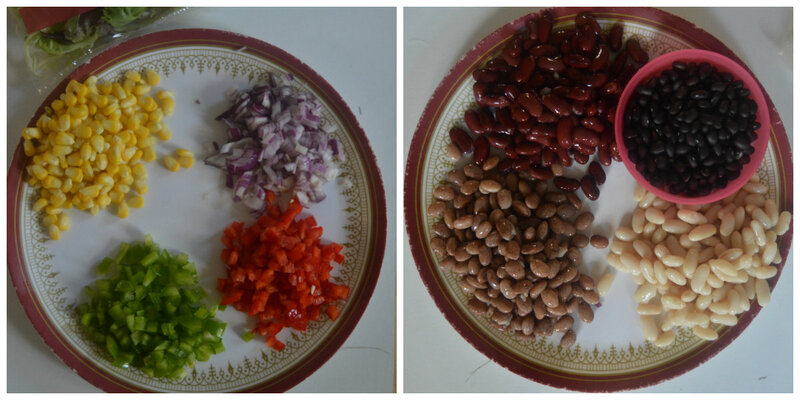 You can make the same salad with just one or two beans or just the Rajma (red kidney beans). Feel free to add tomatoes and cucumbers too. Adjust the tabasco / Nandos sauce as per spice level.